Bruce Roter standing in front of the New York State Capitol, a place he says some would claim is "the epicenter of all that's wrong with New York state government." Edit note: Since this story was first published, former Assembly Speaker Sheldon Silver was found guilty of taking nearly $4 million in bribes and kickbacks. We have updated the story to reflect this change. Las Vegas has The Mob Museum. Washington, D.C., has the International Spy Museum. And if a concerned citizen has his way, there will be a Museum of Political Corruption in Albany, N.Y.
New York is considered the nation's most corrupt state, according to a national poll by Monmouth University this year. This month alone, two politicians who were among the state's most powerful, are facing corruption charges in court. 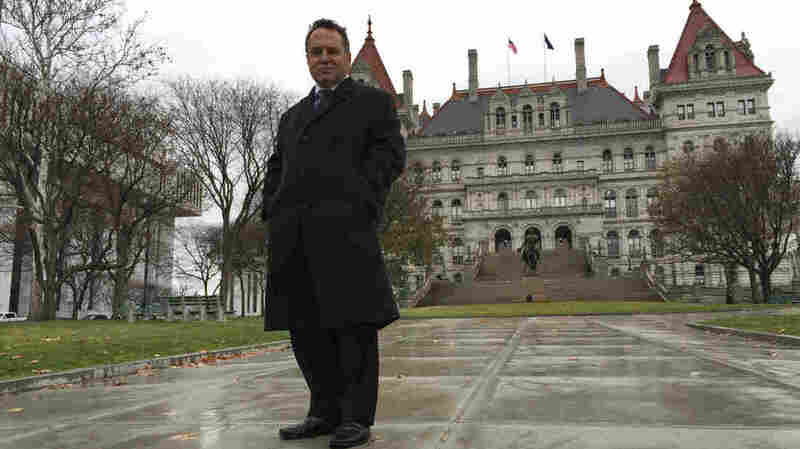 In Albany, Bruce Roter has secured approval to build the Museum of Political Corruption, dedicated to the state's scandalous past. "Welcome to the state capitol, a marvelous piece of Romanesque architecture," Roter says. "And what some would claim is also the epicenter of all that's wrong with New York state government." The state has a rich tradition of political corruption. Remember Boss Tweed and Tammany Hall? But you don't have to go too far back in history to create a museum exhibition. In the last decade alone, more than 30 state officeholders have either been accused or convicted of wrongdoing. On Monday, the former Assembly speaker, Sheldon Silver, was found guilty of taking nearly $4 million in bribes and kickbacks. He was convicted on charges of conspiracy, fraud and extortion. The former Senate majority leader continues to face separate corruption charges in court. In the last decade alone, more than 30 state officeholders have either been accused or convicted of wrongdoing. On Monday, the former Assembly speaker, Sheldon Silver, was found guilty of taking nearly 4 million dollars in bribes and kickbacks. He was convicted on charges of conspiracy, fraud and extortion. The former Senate majority leader continues to face separate corruption charges in court. "I tell people, quite frankly, I want to institutionalize corruption," Roter says. But, Roter's not a curator or a historian. He's a music professor at the College of Saint Rose in Albany. 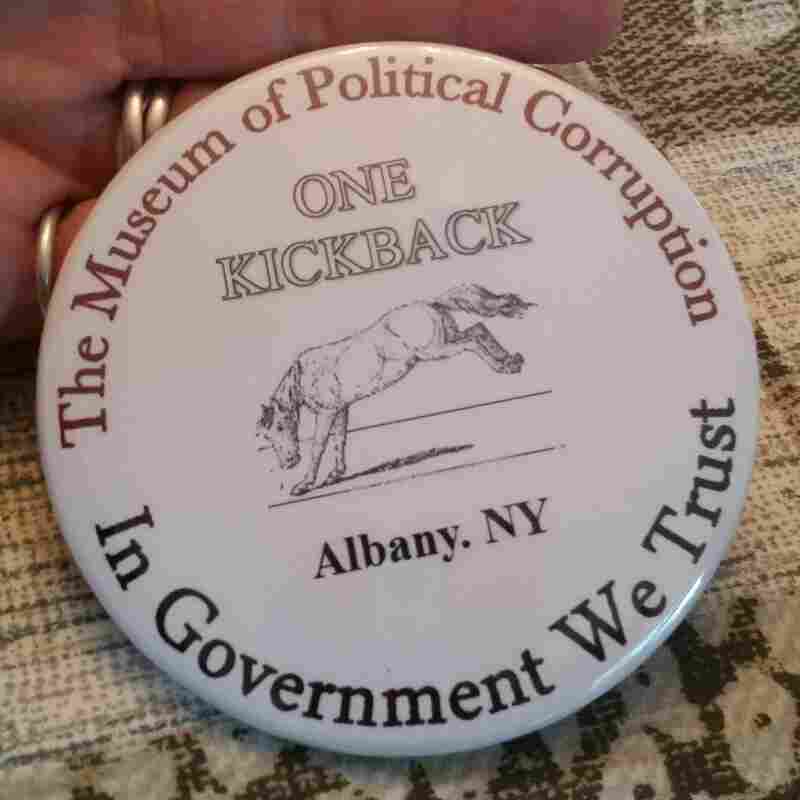 Every member of the board for the Museum of Political Corruption received this "kickback" button in their information folders at a recent meeting. Still, two years after he came up with the idea he has a provisional museum charter from the state and a nonprofit status from the IRS. He's driven by corruption. "I want to put it in this museum. I want it to be laughed at, and I want people to learn about it," he says. In fact, he's even held the museum's first board meeting in his own dining room. "I am pleased to call to order this meeting of the board of trustees of the Museum of Political Corruption," he said on a recent afternoon. Lawyers, professors and other professionals recently gathered for lunch and discussed their progress so far. "We've opened our museum store online, where you can purchase items such as kickbacks and perhaps someday a Preet Bharara action figure," he says, drawing laughter from the group with his reference to one of the U.S. attorneys in New York who's been called the state's "anti-corruption crusader." "Indictments to be sold separately." Roter also plans to build a "Lobby of Lobbyists" and "Tammany Lecture Hall" inside the museum. "We're going to have the Cozy Crony Cafe, and we're going to have a cookbook entitled 'How to Cook Your Books' Cookbook," he explains. Puns aside, museum board member Frank Anechiarico — who teaches government at Hamilton College — says he hopes this museum will appeal to young visitors. "When you grow up in this country you start paying taxes," Anechiarico says. "And those taxes are supposed to be used to benefit you in particular ways. And here's how those taxes become actual government services. And here's what can go wrong. And here's what we need to watch out for as citizens." The museum's organizers say they want people to leave the museum feeling less jaded about politicians. Donna Kuba serves on the board and designs museum exhibitions. "I personally believe and hope that most politicians don't go into this politics with the idea of being corrupt," she says. "But somehow or another, the process helps temptation." The Museum of Political Corruption is set to open in 2019, according to Roter.